After nearly seven years in the making, plans have been announced for the Liffey Cycle Route. Planning for the project by the National Transport Authority began seven years ago, but now the €20m project has been revealed for the quays by the NTA and Dublin City Council. The segregated 5km cycle path will run on both sides of the Liffey. More than 30 trees will be removed to facilitate the track, in addition to the loss of more than 100 parking spaces. However, unlike previous plans, the newly proposed route will not result in cars or buses being diverted away from the quays. Cycling campaigners have said that the new plans will address a number of blackspots for cyclists along the River Liffey, with hopes that the number of incidents along the quays will be reduced thanks to the plans. The route will run in both directions between the Phoenix Park and the East Link Bridge. Beginning at Phoenix Park, it will run along the left hand side to Fr Mathew Bridge next to the Four Courts, along the buildings side of the road. From there on to O’Connell Bridge, the route will move riverside in an attempt to avoid impacting on bus stops along Bachelors Walk and Aston Quay. The cycleway will remain riverside for the continuation of it’s length until the East Link Bridge. Commenting on the plan, Anne Graham, Chief Executive Officer of the NTA, said: “The Liffey Cycle Route is a key objective of the cycle network plan for the city and NTA has been closely involved in this project since 2012. 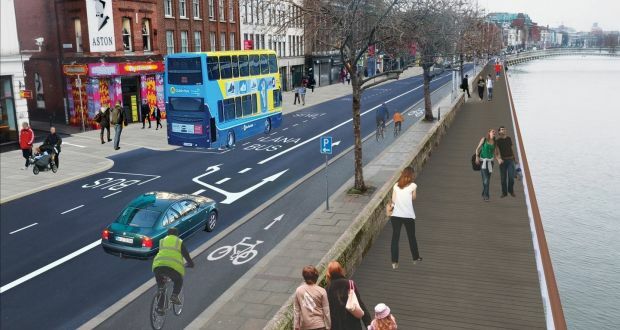 “This plan means there will be safer cycling facilities and an improved environment for pedestrians along the Liffey and we believe that this will encourage more people to cycle and walk as part of their daily commute. Minister for Transport, Shane Ross, welcomed the proposals for the cycleway.